Author Ron Carlson was an unassuming, baseball-playing college student until a Fitzgerald story turned him into an impassioned English-major library vandal. A good book, encountered at the right place and time, can foist a new sense of vocation on an unsuspecting reader, jarring him or her from a more conventional life towards something urgent and mysterious. When I asked Ron Carlson, author of Return to Oakpine, to choose a favorite passage from literature, he remembered how the stories of F. Scott Fitzgerald captivated him utterly as a young man; the would-be geology major fell so thoroughly under Fitzgerald’s spell that he began mooning around the campus at night, pondering words like “ectoplasm,” and trying his hand at short stories. Return to Oakpine features four friends, former bandmates, who rocked their high school prom in the 1960s. Thirty years later—aging and scarred by illness and disappointment—they come home to Wyoming for one last show. Carlson’s stories have appeared in The New Yorker, Harper’s and Esquire; his short-short stories, like “Bigfoot Stole My Wife,” are widely anthologized models of the genre. He’s the chair of the MFA writing program at the University of California, Irvine. He spoke to me by phone. Now, I’m not a vandal. But I couldn’t help myself. I think I wrote: Look at this! As if I were some kind of guide or imprimatur. There was an ache in it, an astonishing ache even in the context of the abundant rue and sorrow of Fitzgerald’s stories, and it felt so much bigger than me. It stirred me so deeply I had to leave some kind of mark. I bet that copy is still in the University of Utah library somewhere. 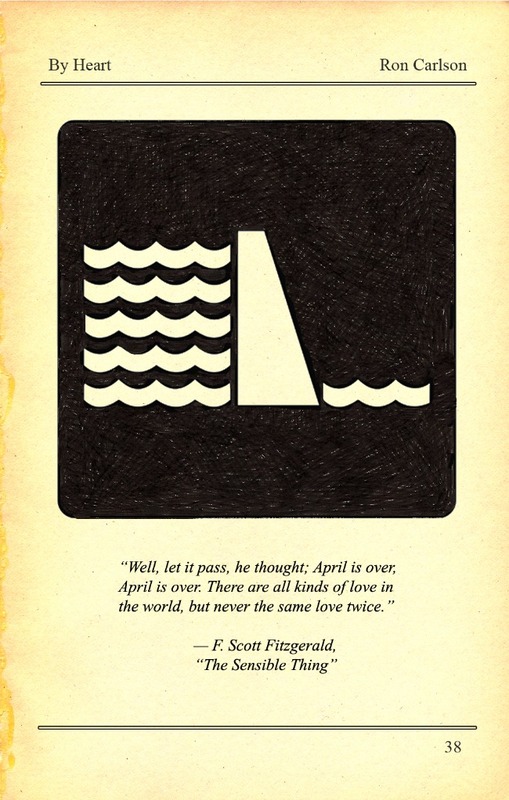 I was a sophomore, and deep in the throes of a Fitzgerald obsession. I had this remarkable professor, Ken Eble, who wrote a book on Fitzgerald for the Twayne authors series, who’d been my guide. I was a good college kid, all-American and baseball-playing, living in the dorms with a million barbarians. I did not expect to be claimed by Fitzgerald hook, line, and sinker. This Side of Paradise—that sweet, sophomoric pastiche of notes, scenes, poetry, and plays—I felt like he’d written the book just for me. And this ineffable lyric poetry about loss—it stung. It was different from everything else in my life, but it claimed me. Like I didn't know I was magnetic, and then something magnetized. It felt like an incursion. Something came off the page and stung me, and I thought—that’s not fair. I’d had the experience once before, reading Huck Finn when I was 13, when Buck Grangerford is killed. This feeling—that’s not right, this is just a book, how dare it make me feel so much? I was just at the very edge of developing an inner life, alone for the first time, just starting to date. As you assume the first dimensions of a private life, you are lucky if you come across something in literature that speaks anywhere near you—you are drawn to it, moth to the flame. For me, I was drawn to a sense of mystery, because I was a total innocent, and so much was mysterious to me. And I loved Fitzgerald because he came so close to naming the ineffable. I didn’t understand this romantic reaching he pulls off, but it had a reaction in me that was spiritual, emotional, and mystical. I’d found some corner of literature that had my initials on it. Something that felt intended for me. It was personal. It’s not about those moments when everyone marches lockstep and announces, “This is great, this is a masterpiece” But where does a book get you? Where does it come and take you by the sleeve and say, Hey you, Ron: Look at this. And something happened to me: I began to write. Professor Eble let me hand in stories for his class, in lieu of critical papers. We had no correcting typewriters in those days—it was the mid-’60s—but we typed on correctable paper. (I remember one brand was called Miller’s Falls; my next-door neighbor had it, and it made me crazy that he could erase while I was stuck with my typos.) I wrote my first two stories. One was called “The Saturday Evening Past”—I just thought that was so clever, a little nod to The Saturday Evening Post where Fitzgerald published so many stories. I remember that I used the phrase “swirling ectoplasm”— I took right from Fitzgerald, and in my hands it was a real laugher. I was reaching much further than I could grasp. Shortly after that, I met a real mentor at Utah, David Kranes, who read my writing and was the first guy to tell me: You could do this if you wanted. It’s hard for me to explain how strange this vocation was in the context of my life, as it was then. I was a baseball player. My parents were farmers' kids from South Dakota. My dad was an engineer. I wanted to be responsible and major in something pragmatic. But encountering these adult figures who were so committed to literature—and feeling, on a visceral, personal level, that literature itself has a life—it changed my orientation. I was an innocent, young reader when Fitzgerald came out and tapped me. But when I went home on holiday I wasn’t exactly keen to talk about the various mysteries of my new major in English. I tried to do everything I could not to major in English. When I was a junior, I took classes in almost every department. I tried to hurl myself at a major in geology. But it just kept coming for me: English. It was a feast. So I continued. I went on, did a master’s at Utah and began a teaching career. It was not pragmatic—I really felt I was riding against the grain. I didn’t talk about it much with others, my life in books. Those weren’t the days. You didn’t meet writers on every corner. I was wrestling with these feelings when I graduated. My first novel was called Betrayed by F. Scott Fitzgerald, about the difficulties of graduating from college, the longing and mourning you feel when all your promise seems to float away. The book was a pillar-to-post wandering into the unknown, which is what I was doing then in my life. There’s a moment in This Side of Paradise when Amory Blaine says, “At least I knew myself,” and it’s the biggest lie in the book: He knows everything but himself. So I started my novel that way. The first line is, “Let’s get the big lies out of the way: At least I knew myself.” I was under Fitzgerald’s spell then, striving for his lyricism even as I felt my own life was not measuring up to his romantic vision. There were flights I tried in that book I would not have attempted without his influence. You can read a book too early or too late. Connections can be missed when the timing’s not good. He wrote so many stories under the gun, trying to pay his rent and keep that lifestyle going. Those ones don’t hold up the way they did for me when I was younger. When I go back and read Hemingway’s stories, for instance, they all hold up—but Fitzgerald’s often don’t. I think he did his best work when he was not thinking about the commercial market—in The Great Gatsby, which is a marvel, or stories like “Winter Dreams,” which could not have run in The Saturday Evening Post. Still, they were the right stories for the young man I was in that moment. I’m glad I encountered them when I did, because the hold they had on me was immense. But I stayed with Fitzgerald a long time. I still teach him and read him. We’re looking for work that crosses the proscenium. You’re there, you’re looking in, and it steps off the stage and holds something out towards you. It doesn’t violate or wreck the order of things but feels immediate and intimate. I don’t know that I can say more than that. For me, this experience was literally part of my education. I didn’t know things, and then I began to put them on through reading. It was the very beginning of a kind of understanding and love for how complicated people are.